Whether enjoyed in hot tea, on a peanut butter sandwich or in the form of a scented candle, honey makes life a little sweeter. For Tracy and Christina Hunter, honey is a way of life. Though they both have full-time jobs as teachers, they also carry on a 100-year legacy of beekeeping at Hunter’s Honey Farm, their fourth-generation honey farm in Martinsville, Indiana. The Hunters’ family-friendly farm attracts thousands of Hoosiers each year with opportunities to take tours, make their own candles, purchase local honey and bee products, and harvest their own Christmas trees. An on-site store, open Monday through Saturday, features hundreds of products made from the honey, pollen, propolis and beeswax produced on their farm. The family also sells its products through its online store and at various farmers markets, events and orchards throughout the state. 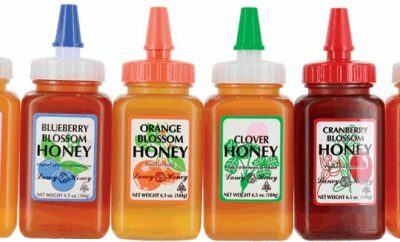 Shoppers will find everything from half a dozen different varieties of honey, 33 flavors of honey sticks, six types of honey candy, honey snacks, beeswax products, sauces and honey fudge (their newest product). Christina Hunter, a family and consumer science teacher, develops many of the recipes for the items in the store. She makes all of the gourmet spun honey, beeswax candles and many of the honey treats. Tracy Hunter, a high school science teacher, learned the art of beekeeping and honey harvesting from his grandfather, Gilbert Perigo, who was also a teacher. Perigo began his honey farm in 1910 by managing several hives on behalf of his father’s orchard and eventually built his apiary – or bee yard – to more than 800 hives. Perigo passed along his love for beekeeping and teaching to both his daughter and grandson. Today, Tracy and Christina continue the family tradition with their children. The farm hosts an annual Fall Harvest Celebration in September inviting the public to watch the family extract and bottle the honey, in addition to many family activities such as horse rides, hot-air balloon rides, face painting, candle rolling and more. This year’s celebration also marked the family’s 100-year beekeeping anniversary. There are 300 known varieties of honey. Based on the crops the honeybees pollinate, honey varieties range from white in color and mild in flavor to dark and strong. 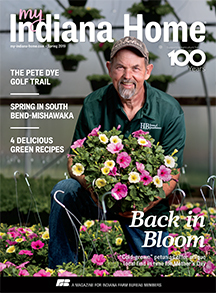 Hunters’ bees provide contracted pollination services throughout the state for everything from melons in southern Indiana to orchards in central Indiana to blueberries in the north. The bees’ cross-state journeys result in six to eight varieties of honey. During a high production year, the farm produces 13,200 pounds of honey. Considering that one worker honeybee produces one-twelfth of a teaspoon of honey in her lifetime, that is a lot of bees. Bee pollen, known to relieve allergies and boost energy, is considered to be the most nutritious food on the planet. Each member of the Hunter family takes bee pollen every day. Other bee products also have health benefits. Royal jelly, the substance that feeds the queen throughout her lifetime, contains many properties that assist with the immune system. Propolis, a wax like compound collected by bees from the resins of various trees and flower buds, is known for its antibacterial benefits in wound treatment. The Hunters note that honey, the only food that never spoils, isn’t just a sweetener but is good for you, too. Their website shares tips on how to easily substitute honey for sugar in cooking and baking. The fourth generation of Hunters continues the family tradition. Sixteen-year-old Ross is the farm’s No. 1 queen grafter – a job that entails taking eggs from a queen and placing them into queen-less hives to grow new queens, replacement queens and queens to sell to other beekeepers. Nine-year-old Mackenzie developed her own moisturizing honey soap, sold at the farm’s on-site and online stores. The Hunter kids also assist with the planting, care and sales of the family’s Christmas tree farm – or “college fund,” as Tracy refers to it. This season, the Hunters expect around 1,000 families to visit the farm in search of the perfect tree. The old-fashioned family experience of chopping down a Christmas tree comes complete with hot honey spiced cider and warm fire – along with a saw to cut down their choice of the scotch and white pine trees. The Hunters then shake out the loose needles and bale the sold-by- the-foot tree for transportation. You can plan your trip to the farm by visiting www.huntershoneyfarm.com or calling (765) 537-9430. Sandy, I’m checking with the Hunters, who provided the recipe to us. Every pecan pie I’ve ever made calls for corn syrup, so I’d assume that’s what they meant. From Tracy Hunter: I would recommend light corn syrup, so as not to mask too much of the the other flavors. 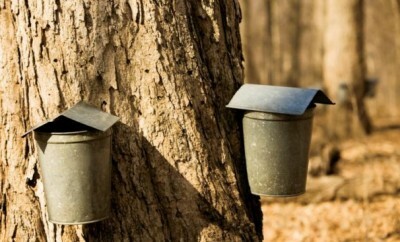 You can find all of the contact information for Hunter’s Honey Farm here: http://www.huntershoneyfarm.com/s.nl/sc.9/category.83/.f . I will also email you the phone number. Hope this helps and thanks for reading! what is price of your honey per pound, i live in morgantown in. To find out more about Hunter’s Honey Farm products, visit the farm’s website: http://www.huntershoneyfarm.com./s.nl/sc.2/.f . There you’ll find product information as well as more information about the farm. To contact them by phone about their prices, call (765) 537-9430. Your site in informitive, however if you could move the (like, tweet,pinit, share) bar some where else it would make reading your page easer. The bar on my screen is on the left side about the middle of the page and I can not close it. Thanks for your suggestion. We’ll take a look at that problem and see what we can do. A lot of times, that bar appears along the left side and out of the way of the article text if your window is big enough. But we’ll take a look at it to see if there are adjustments that can be made.